Analytical hands-on review with insights from Sebastien Chaulmontet who designed the watch. Innovative use of a hairspring remontoire to provide constant force to the tourbillon. The architecture of the movement is unique and very pleasing. On the pricey side of the tourbillon divide. We examined the Arnold & Son Constant Force Tourbillon and chatted with Dr. Sébastien Chaulmontet Head of Innovation at the watchmaker to discover what makes this watch special. 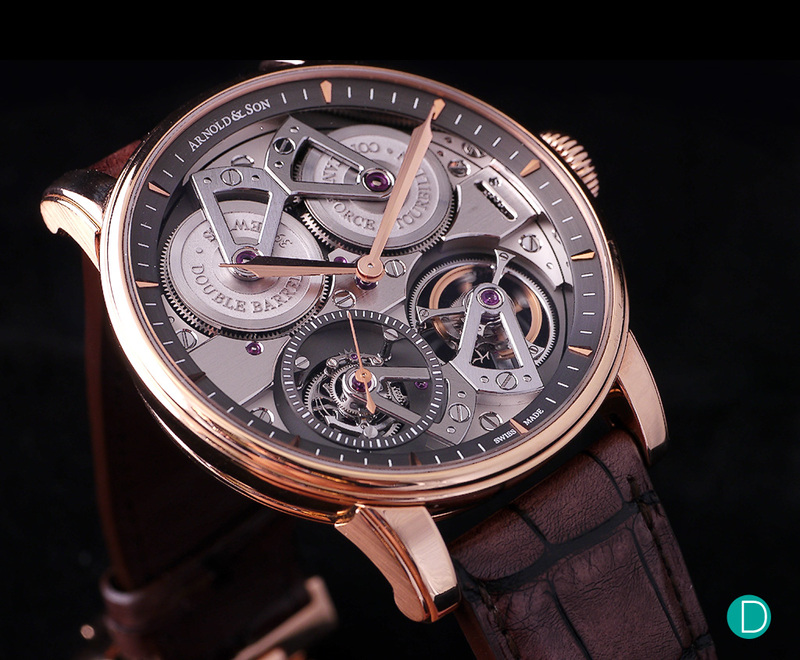 Arnold & Son Constant Force Tourbillon, in 18k red gold. To describe Sébastien as nerdy or intense is merely to understate the fact. He is a supreme watch nerd, but not one devoid of character. He has been with the company almost since the time they split from the British Masters, and became independent. And have been providing innovative ideas to the design of the movements at La Joux Perret ever since, right through the purchase of Arnold & Son, Angelus and La Joux Perrer by Citizen. He continues to lead a team of watchmakers and engineers who apply innovative solutions to age old horology problems. 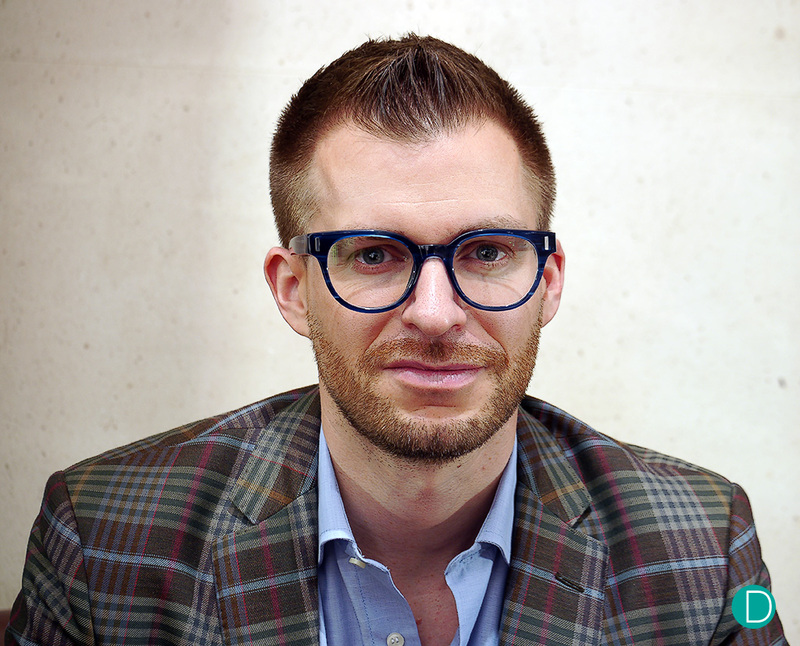 Dr Sebastien Chaulmontet. 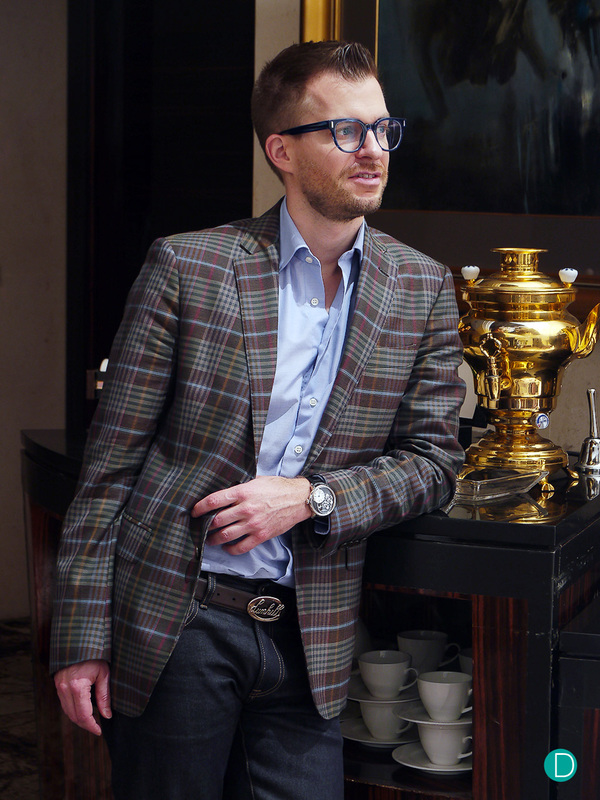 A lawyer by training, and an extraordinary movment designer and watch enthusiast. Photographed October 2016 in Singapore. Interesting innovations like the huge, photo realistic moon in the Arnold & Son HM Perpetual Moon, to the DSTB where the jumping seconds mechanism is displayed for all to see on the dial side, to the DTE double tourbillon with two trains showing two timezones, and the Time Pyramid which echoes the roots to a clock made by Arnold & Son, not to mention the amazing Angelus U10 Tourbillon. Many of these innovations are the result of out of the box thinking. Made possible only because Sébastien was not formally trained as a watchmaker. Nor an engineer. But he obtained his doctorate of law. Sébastien tells us he has always had a keen interest in watches and clockworks, and although he made his early career as a lawyer, his fertile mind was always tinkering with ideas to make interesting watches. He submitted some of his drawings and notes to La Joux Perret, then fresh from being a change of management and change of name from Jaquet SA. He was offered a job to head the movement design. A job which he holds till today. Photographed in Singapore, October 2016. Talking watches with Sébastien is extremely interesting as he is a storehouse of interesting information about the industry, about technical details on watches, especially chronographs. He confesses that he is a rabid collector of vintage chronographs, and have authored a book with Dr. Joël Pynson: Chronographs for Collectors. The book chronicles important vintage chronographs like the Omega Speedmaster, Heuer Carrera, Rolex Daytona, Longines 13 ZN, Universal Tri-Compax, Breitling Navitimer, Zénith El Primero, but also classics which are often overlooked like Mido Multi-Centerchrono, Minerva 13/20, Excelsior Park 4, Index-Mobile of Dubey & Schaldenbrand, Eberhard Contodat, Enicar Jet Graph, Invicta Chrono-Sport, Blancpain Air Command and Angélus Chrono-Datoluxe. 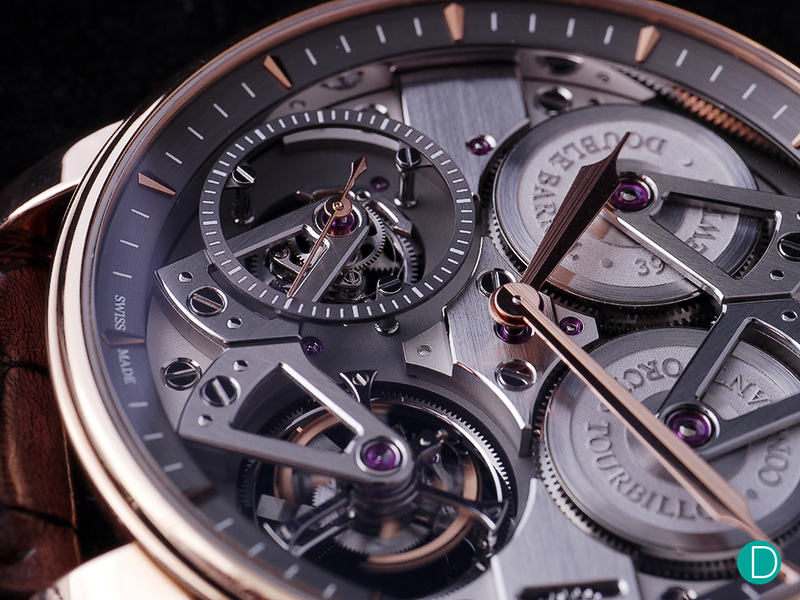 The Constant Force Tourbillon is a rather interesting watch. It looks like no other watch we have seen. The design is powerful, and highly technical in its aesthetic. The Arnold & Son Constant Force Tourbillon. The dial is almost non-existent, allowing the entire movement to be showcased on the dial side. The case is a generous 46mm in diameter and is in 18k red gold. The watch is limited to 28 pieces and have a nominal water resistance of 30m. The dial is almost non-existent. What is there is a small vestigial, more like a ring around the face of the watch than a proper dial. This leaves the movement exposed for the viewer to examine. The dial is a small ring like structure marked with minutes and hours. 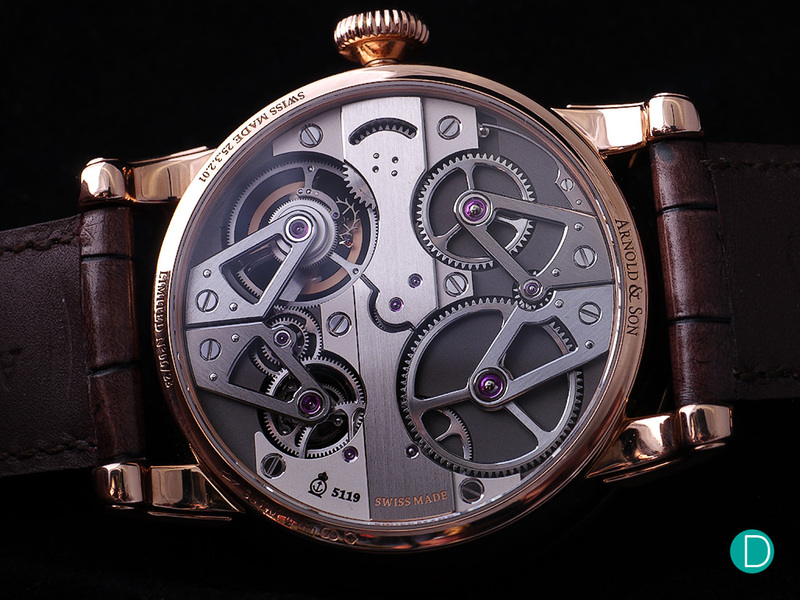 The entire movement, with its four bridges can be viewed from the dial side. Four symmetrical bridges made of steel, chamfered and polished stand proud on the dial side. They support the constant force regulator at 4 o’clock, the tourbillon at 8 o’clock with its gold seconds hand which moves in 1 second increment every second. And the double barrels at 2 and 10 o’clock. The symmetry is quite a sight to behold and we confess we find it very pleasing…despite or because of its very mechanical and technical appearance. The nerd in us bekons. From the center of the face arises the hour hand and minute hand in polished red gold. The hands are a kind of an art deco style with polished facets. From the dial side, the finishing on the movement is also clearly visible. The movement proper is in maillechot with the aforementioned steel bridges and NAC grey treated main plate. The movement is an in-house manufactured, by La Joux Perret, A&S5119, which can be seen from the dial side, but also from the back of the case. The case back is also quite technical in aesthetics, which we really like. The bridges follow the symmetry front to back, repeating the 4 steel bridges found on the dial side over to the back. The mainplate are nicely designed to allow Arnold & Son to demonstrate traditional watch craft, and features several beautiful anglage edges, a few nicely executed outward and inward angles. If we had a nit to pick, it would have to be that we prefer the angles to be more acute than the slight rounding found on the very tip of these angles. This rounding is particularly visible on the inside of the steel bridges where it is opened up. The inside edges are, however very nicely anglaged. The double stars of the movement are the constant force mechanism and the tourbillon. We find the constant force system to be quite fascinating. The system is patented. Sébastien sent us the link to the patent documents but as it is a highly technical document and in French, we are not in the position to examine it. We provide the link for those who may be inclined to peruse here. However, we are quite familiar with the workings of a remontoire powered constant force system. The constant force mechanism, featuring a remontoire hairspring which discharges and rewinds once a second. The constant force mechanism makes one revolution a minute in one second steps, and on it, is mounted the seconds hands. Note as a tribute to John Arnold and the marine origins of his clocks, the Arnold & Son logo of an anchor is incorporated. Instead of power from the mainspring feeding directly to the escapement/tourbillon, it charges a small hairspring which in turn releases a consistent amount of power to the escapement/tourbillon once each second. The device also drives the true-beat seconds hand (jumping seconds, dead seconds or seconds morte). This seconds morte indication is one of the features of the early Arnold & Son timepieces made during the 18th century. 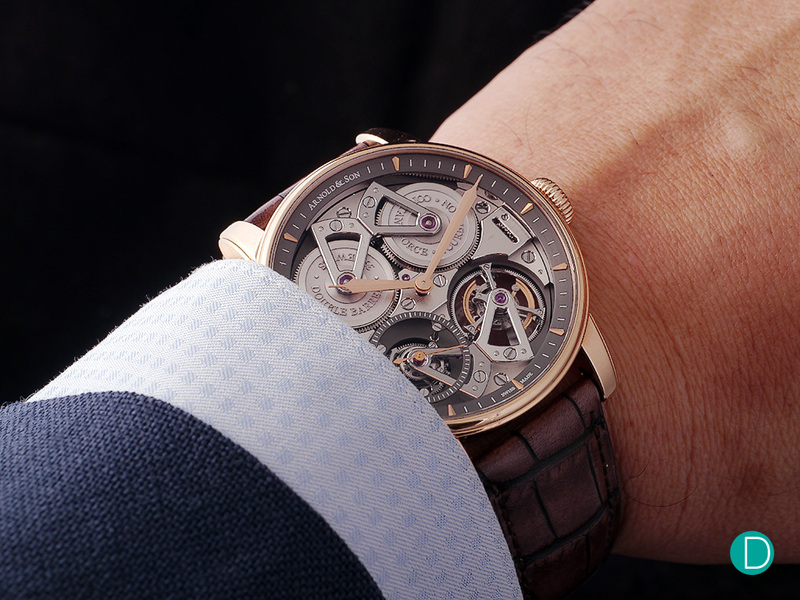 Arnold & Son Constant Force Tourbillon. 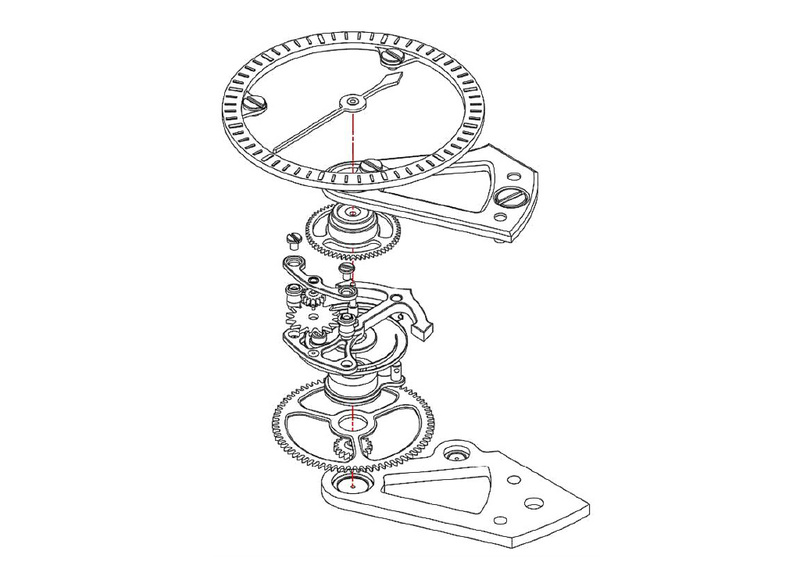 The tourbillon on thelower right of the cage moves in step with the constant force mechanism on the lower left. And creates a beautiful animated spectacle. When the power from the mainspring drops below that required by the constant force mechanism, the movement stops rather than running at lower precision. The constant force device rotates once per minute in increments of one second, visually mirroring the rotation of the constantly rotating tourbillon cage. The constant force mechanism optimise precision with the movement in stable positions and the 60-second tourbillon averages out gravitational errors of the escapement by constantly rotating it through 360°. Interestingly although the tourbillon was invented by A.L. Breguet, the first watch that he installed it on was on a Arnold pocket chronometer which Breguet presented to John Arnold’s son in 1808 as a mark of his esteem for John and also to commomerate his death in 1799. This watch is now in the permanent collection of the British Museum in London. The Constant Force Tourbillon by Arnold & Son retails for a rather hefty S$ 276,400 inclusive of GST. And in terms of the competitive landscape, we see a field which is perhaps limited to only one. The F.P. Journe Tourbillon Souverain Remontoire d’Égalité (S$ 237,200 inclusive of GST for the rose gold version). The Journe is a bit more classical in its aesthetics, in that it has a proper dial, with a cutout to show the tourbillon and an additional subdial bolted on for the time indication. The early examples had a brass movement and also featured a cutout to show the spinning constant force mechanism. Later versions had a separate sub-dial bolted to the main on which is mounted a seconds morte hand. Feature for feature the Journe watch and the Arnold seem neck to neck. The Journe first saw light of day in 1999. It was the first wristwatch ever to be fitted with a remontoire d’égalité (constant force). The revised version, with the seconds morte and a rose gold movement won the ‘Aiguille d’Or’, the highest prize awarded in the Geneva Watchmaking Grand Prix in 2004. The Journe constant force device uses a blade spring, while the Arnold uses a coiled hairspring as the remontoir. And the Journe watch is available in various case metals as well as special executions. 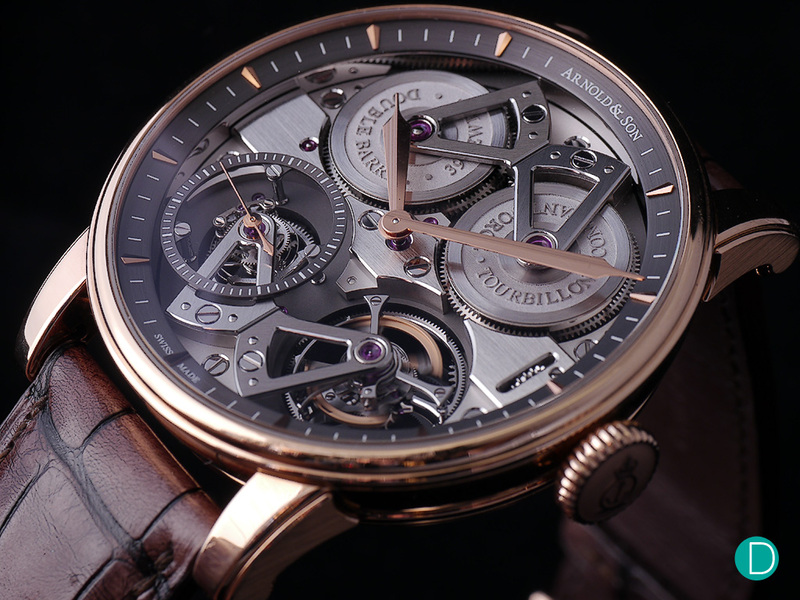 Frankly, we are slightly besotted by the Arnold & Son Constant Force Tourbillon. Um…if slightly is an adverb which can be applied to being besotted. Heck, we are head over heels in love with it. The is the raw technical, mechanical aspect. But this nerdy side is well packaged within an elegant aesthetic which we find very appealing. The symmetry of the dial and back is alluring. The way the constant force mechanism and the mounted seconds morte jumps each seconds, perfectly echoing the constantly rotation (actually the tourbillon cage also makes 6 small steps every second as dictated by the 21,600 bph escapement) of the tourbillon. Marvellous. Geeky. We do think the price of entry to this level of watchmaking to be steep. The Arnold & Son Constant Force Tourbillon retails for about 16.5% more than the F.P. Journe Tourbillon Souverain Remontoire d’Égalité. Perhaps an attestation that the Arnold might be ambitious in its pricing. As detailed, functionally the two watches are very similar, although the aesthetics of each watch is totally different. Horses for courses. On the wrist the Arnold & Son Constant Force Tourbillon is very comfortable, despite its 46mm diameter. The lugs curve rather nicely to hug the curves of the wrist. The providence of the movement and design is also alluring. Totally conceived and manufactured in-house. 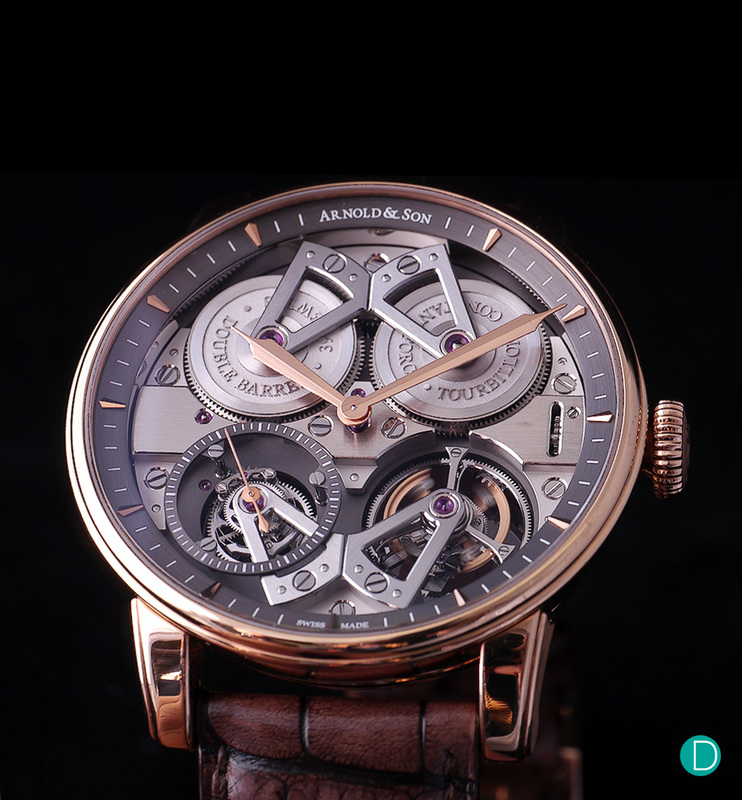 Though it lends its name from the famous John Arnold and his firm, the current Arnold & Son not only shares the name with John, but the movements and watches are designed as inspirations of the English firm.